Physical Jews were types of spiritual Christians by faith not blood! Spoke truth in exposing sinful behavior of others knowing he would be hated and ostracized. Both parents “treasured in their hearts” the news that their children would be a future king. Judah offered to sell Joseph for 20 pieces of silver. Judah in Greek is Judas who sold Jesus for 30 pieces of silver. Sold for slave price in pieces of silver (20p in 1900 BC, 30p in 33 AD, inflation) Through archeology, we know the price of one slave increased through inflation. Unlike many other Bible characters, no sin of Joseph is recorded. Jesus was truly sinless. Both wore royal robes and dressed as a king, Jacob wore pharaoh’s royal robe with necklace. Jesus wore purple robe while being mocked with crown of thorns. Joseph given seal ring for 7 abundance years before 7 years of famine and death. Jesus broke 7 seals that caused famine and death. 10 brothers condemned to prison and released after 3 days. Jesus condemned and rose from dead after three days. Ancient Jewish Targum identified Simeon as primary ringleader to kill Joseph. “And Simeon and Levi, who were brothers in counsel, said each man to his brother, Behold, this master of dreams cometh. And now come let us kill him and throw him into one of the pits and say that an evil beast bath devoured him; arid we shall see what will be the interpretation of his dreams.” (Jewish Targums of Onkelos and Jonathan Ben Uzziel On the Pentateuch, J. W. Etheridge, Gen 37:19, 1892 AD). Jesus gave bread to Judas to identify him as the betrayer. Righteous judgement: Joseph spared innocent (Reuben-oldest) for the guilty Simeon (next oldest) who spent several years in jail until the brothers returned. Jesus is our perfect judge who can separate the sheep from the goats. Simeon got the worst land in the Negev and was absorbed into Judah and Levi got no land at all. Amazing grace given to wicked: Joseph returned his brother’s food money, Jesus’ Grace to us. Innocent suffers outside city: Benjamin was arrested outside the city/Jesus crucified outside Jerusalem. Substitutionary atonement: innocent Benjamin for wicked brothers. Jesus for sinners. First news that Joseph/Jesus were alive was not believed. Jacob would not believe Joseph was alive. The male disciples would not believe Mary when she reported Jesus alive. Substitutionary atonement: Innocent Joseph/Christ suffered for guilty brethren. Comforted those who betrayed him and felt guilt. Disciples were comforted of guilt of abandoning Jesus at the cross Except John, who was the only one who was at the trials and the foot of the cross. After Joseph/Christ became king both began summing up of all things, making pharaoh/God all in all. Hebrews under Joseph and Christians under Christ were exempt from losing their blessings, but enjoyed “all physical/spiritual blessings” while the rest suffered. This “low chronology” follows K. A. Kitchen and O. Keel. 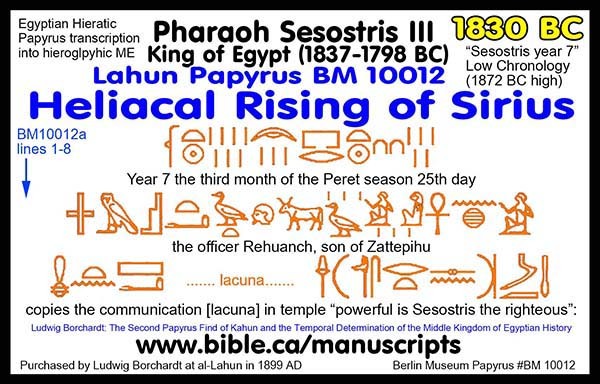 Papyrus Berlin BM 10012 marks the heliacal rising of Sothis (Sirius) on year 7 of Sesostris III which dates to 1830 BC. Douglas Petrovich PhD follows the high chronology which gives a date of 1872 BC. The difference in low/high is based upon the assumption of where the heliacal rising was observed from: Memphis/Lahun (high) vs. Elephantine (low). 1. The true Bible story Joseph being sold into slavery as a type of our salvation in Christ is one of the most important themes in the Bible. 2. It is clear that Joseph was a type of Christ throughout his entire life. 3. 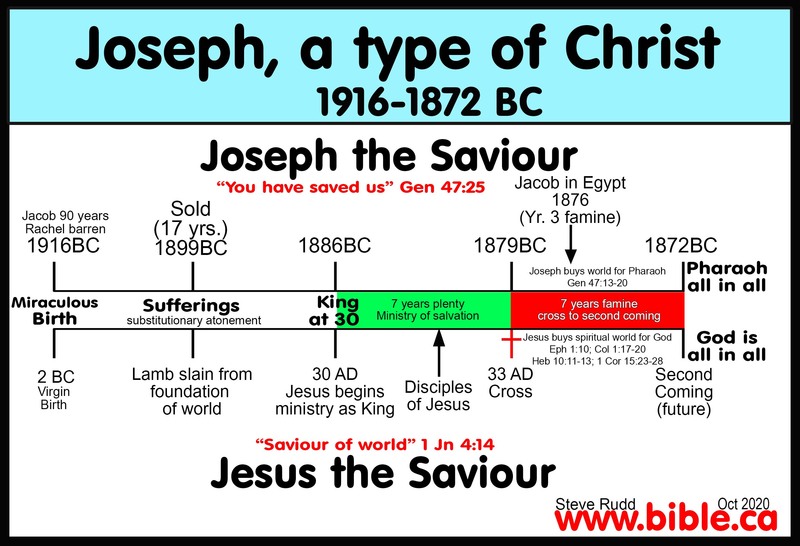 With a carefully constructed time chronology using the latest archeological information we have identified more than 70 different ways that Joseph was a type of Christ. 1. Some good Christians are “absolutists” who will only accept types if they are identified as such in the New Testament. c. These are the only two types specifically identified in the New Testament by the Holy Spirit. d. With this formula, the “absolutists” believe there are only TWO examples of types in the entire Bible. a. While two specific details are identified as types by the Holy Spirit, the rest is wide open. b. We are told the that tabernacle and temple is a type, but we are not told ANYWHERE how or what is typical. While we are told in Rev 5:8 that prayers are represented by incense, we are left to connect the specific dots. c. We are not told how food, drink or annual monthly and weekly festivals are a type of New Testament theology but are left to deduce it ourselves through wisdom. i. While we are told in Heb 4-5 that an eternal sabbath rest remains for Christians in heaven, the narrative never specifically calls it a type or shadow or anything. The Holy Spirit leaves it to the reader to INFER the type between the weekly sabbath and our eternal sabbath rest in heaven. ii. While we are told “Christ our Passover has been sacrificed for us” 1 Cor 5:7, it is not called a type or shadow. Once again we must infer such. d. To say the entire law of Moses is typical of New Testament theology is a very broad brush indeed. a. There are hundreds of these types in the Old Testament that are NOT specifically identified in the New Testament. b. The story of the garden of Eden is a type of paradise restored in heaven. c. The story of Joseph in Egypt, slavery, exodus, baptism into Moses, Mt. Sinai then 38 years at Kadesh Barnea and finally crossing the Jordan into the promised land of “heaven” is universally accepted yet it is all inferential. d. Of course this outline is about a clear and unmistakable pattern of 75 direct parallels between the Joseph and Christ yet nowhere does the Holy Spirit say that Joseph was a type of Christ. e. Even more dramatic is the fact that Stephen narrates the entire story of Joseph in Acts 7:9-19 but never makes any specific connection between Joseph as a type and Christ. 5. Non-Christian Jews deny that the Torah has any types of anything in the New Testament. a. The parallel between Joseph and Christ is so compelling, it can be as effective as Isa 53 in converting Jews to faith in Christ if they are truth seekers and honest. i. It is historically unjewish because first century Jews made far broader and loosy-goosy connections between scriptures than the Joseph-Christ similarities. ii. It is hypocritical because modern rabbis go much further than their first century brethren in making strained and unbiblical connections between scripture and modern Jewish practice. iii. Modern Jews and Rabbis who reject that both Isaac and Joseph were both types of Christ are being very UNJEWISH and it is Christians who following the principles of ancient Jewish Rabbinical interpretation methods. 6. Jews today who reject that Isaac was a type of Christ’s resurrection and Joseph as a general type of Christ as “twisting, stretching and ignoring the context” are themselves hypocritically guilty of the this very crime but TEN TIMES WORSE!!! a. Kosher prohibition of never eating dairy and meat at the same meal is based upon “You shall not boil a young goat in its mother’s milk.” (Ex 34:26; Deut 14:21). Moses obviously permitted the boiling of calves in milk, just not milk from their own mother. Indeed the ancient Hebrews routinely boiled their meat in milk. Dairy cows and meat cows are two different species making it impossible to violate the law of Moses. But today any meat and any milk product is prohibited at a single meal. They consume milk but no meat for breakfast and meat but no milk at the evening meal. And forget about beef pepperoni on your pizza! b. Mosaic Sabbath law says you will not “kindle [ie. start] a fire on the Sabbath.” Ex 35:3. Yet today Jews will ride on elevators that automatically go top to bottom, opening the door, then closing before moving to the next floor up or down but it is a sin to actually push the button outside to call the elevator or inside to direct it to the floor you want. The pushing of the button creates an electric “spark” which they say violates the law of Moses in Ex 35:3. So they can’t push the button, but the huge electric motors that drive the elevator are fine to ride in. Most modern kitchen appliances have a selectable “Sabbath Mode”, which when selected will not allow the fridge light to come on when the door is opened etc. It should be painfully obvious that if it is a sin to push an elevator button for fear of “kindling a fire” then every Jew the world over must turn off the main electrical breaker in his house Friday afternoon and back on Sunday morning… just in time to attend a Christian church!!! d. There are many, many examples of how modern Rabbinical Judaism make laws that “twist, stretch and ignore the context” of the original verse in the Torah. 7. Those who see an Old Testament type in everything! a. Yes, it is a judgement call, agreed. But remember you are not looking for one elephant in the clouds, but a chain of 10 elephants holding trunk to tail! b. There can be coincidental parallels in the stories of the Old Testament which were never intended by the Holy Spirit to be types. a. Isaac blesses Jacob who steals Esau’s firstborn blessing and Jacob flees to Laban in Haran: Gen 28.
b. Esau conquers Horites: Deut 2:12,22.
b. Joseph was Jacob’s first born to Rachel, his favorite wife. This is why Joseph was Jacob’s favorite son. a. 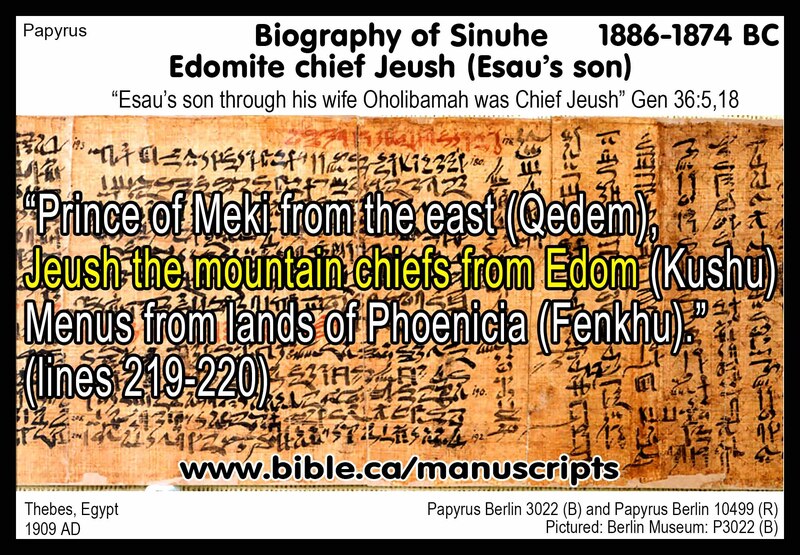 The story of Sinuhe is written which says, “Jeush, the mountain chief from Edom”. a. Joseph, age 17, is sold into slavery by his brothers at Dothan to the Ishmaelites. a. Joseph interprets the dreams of the butler and baker who are release/hung after three days. b. Joseph remains in prison for two more years. a. Joseph interprets dreams of Pharaoh Sesostris II of the fat and lean cows/wheat. c. Joseph marries Asenath, daughter of a priest of On (pagan Egyptian god). d. Isaac dies age 180: Gen 35:28-29.
e. The beginning of the 14 year time clock for the 7 years of plenty and 7 years of famine. b. Jacob sends his 10 sons to get food in Egypt. a. Year 3 of the 7 years of famine. d. In 1876 BC, when the Hebrews moved to Goshen it was year three of the Famine. During this period, all the people of Egypt had to sell their livestock, land to Joseph and become slaves of Pharaoh but the Hebrews were exempt (Genesis 47:27). When the famine ended, the Hebrews were land rich and prosperous. 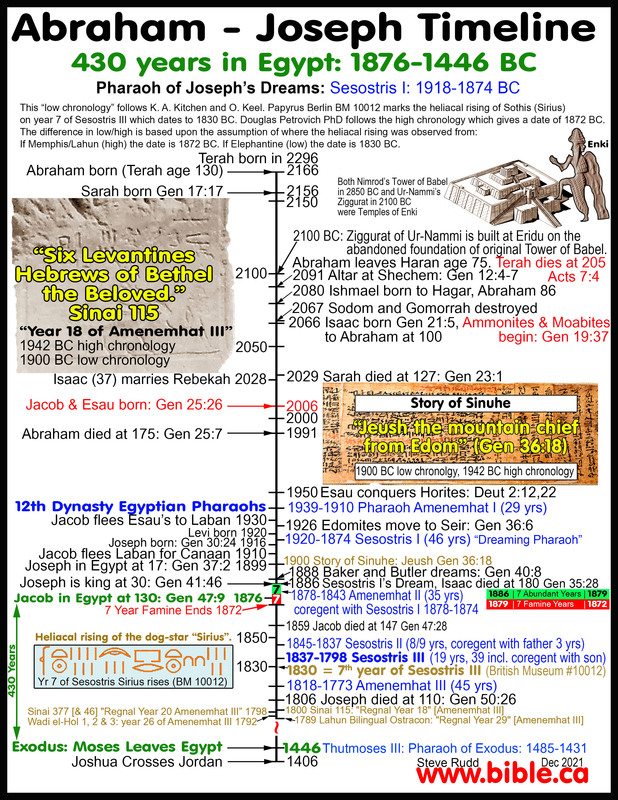 Only Joseph (and the Hebrews) and Pharaoh owned land. Add to this that Goshen, (Avaris, Tel el Dab’a) is at the starting point of the “Way of Horus” which was the main trading road between Egypt up the coast to Byblos and Assyria etc. and the Hebrews were in control of a major ancient shipping port. This explains, in addition to their invention of the first alphabet, why they became so prosperous. This incredible prosperity continued until the defeat of the Hyksos in 1556 BC and the rise of the 18th “Moses-dynasty” pharaohs “who knew not Joseph”. 1556 BC marks the end of Hebrew “easy living” in Egypt and the beginning of the oppression which lasted 110 years until the Exodus in 1446 BC. Even at Kadesh Barnea (Petra), they were again located at a major shipping intersection of international trade for 38 years. 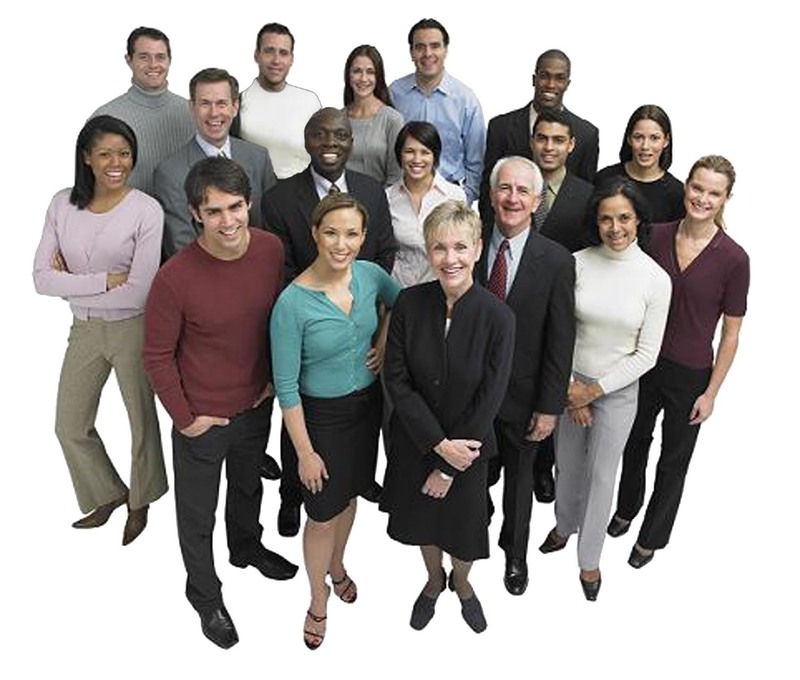 The high literacy rate combined with the business experience explains in part the commercial successes Jews have even in the present day. b. Year 7 (inclusive counting) of Sesostris III is calculated using Paprus Berlin 10012A discovered at Lahun. R.A. Parker calculates the year to 1872 BC. c. Joseph, Ephraim and Manasseh invent the first alphabet on earth for the Hebrew language. II. Did inspired Stephen get it wrong? Jacob enters Egypt with 70 or 75 persons? A. Atheists, Jews, Muslims, Mormons all trash the Bible saying Stephen got the number wrong. 1. Atheists, Muslims and Mormons attack the entire Bible: Tanakh and New Testament. 2. Jews view the Tanakh as inspired (just as Christians do) but attack the entire New Testament as corrupt and full of contradictions and errors. 3. 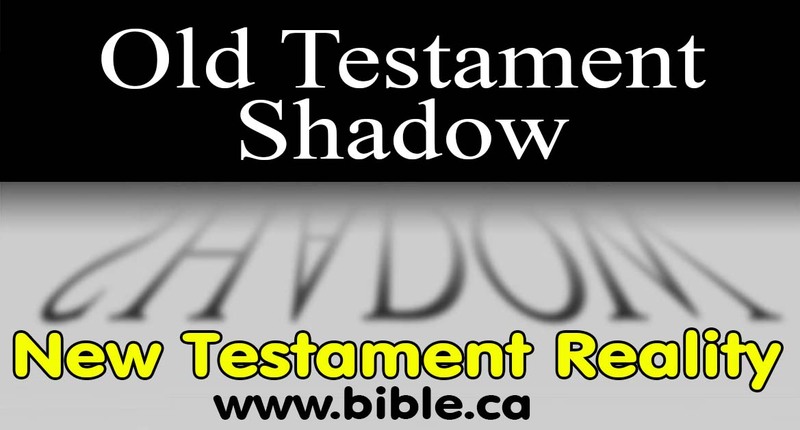 There are no contradictions or errors in any of the 66 books of the Old and New Testament. 1. Rabbi Tovia Singer has attacked the New Testament when there is a bigger gun pointing right back at him with the Old Testament, but he is either unaware of this, or dishonest about it. Having read his materials in detail, we suspect, he is simply uninformed… again. a. First, it is important to note that we defend, EQUALLY, the inspiration and historicity of both the Old and New Testaments. b. Second, there are differences in textual manuscript copies of all Bible books, but they are minor. d. Fourth, there are ten times more textual variants in the Tanakh alone, then there are in the New Testament AND the Old Testament combined. In other words, the New Testament is far superior to the Tanakh, if we use Rabbi Tovia Singer’s own measuring stick against himself! He really shot himself in the foot here, but he either doesn’t know it or is being dishonest about the truth of textual variants in the Bible. e. Fifth, complete copies of the New Testament date to the 4th century AD, whereas the oldest copy of the Old Testament (The Tanakh) is 11th century AD. Once again the New Testament is significantly more reliable than the Old in this regard. 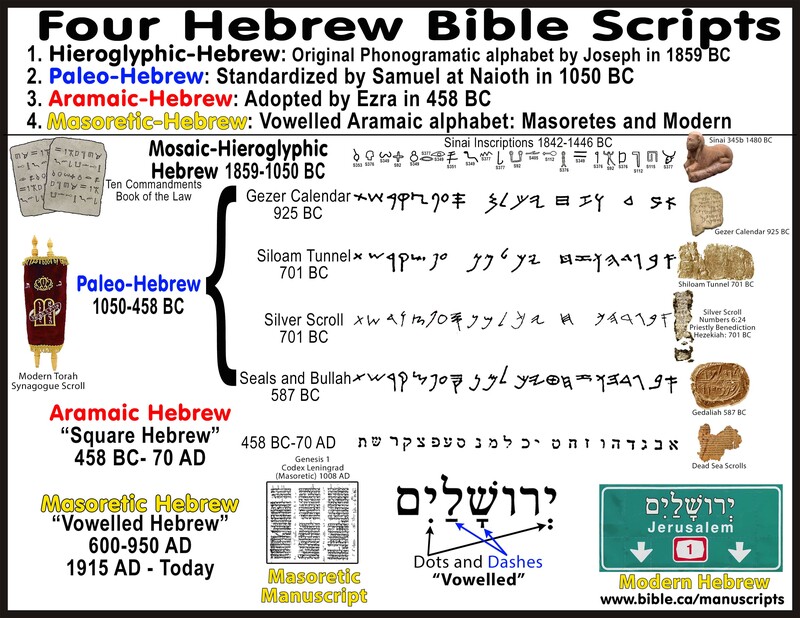 f. Sixth, while we have two complete copies of the New Testament in its original autograph language of Greek, we do not have a single bible verse in the original autograph language of the Torah (first five books of Moses), which was composed in either Hieroglyphic-Hebrew or Paleo-Hebrew. We have one single bible verse found in the Silver benediction scroll of Numbers 25 which dates to about 701 BC. The oldest extant copies of any old testament manuscript is found in the Dead Sea scrolls which use “Aramaic Hebrew” not the original “Paleo-Hebrew”. Even worse, the oldest complete copy of the Old Testament (Tanakh) is the Masoretic Text, which dates to 1008 AD, which is up to four Hebrew scripts removed from the autograph originals of 1446 BC. Once again the New Testament wins by a factor of 10! 2. Conclusion: Stephen got it right! The New Testament has 10 times fewer “variants” (like 70 vs 75 persons) than the Tanakh AND oldest manuscripts of the New Testament are 10 times closer to the autograph copies, than the Old Testament. 3. There are a variety of ways of computing the number who went down to Egypt within the Torah itself! ii. Two other places in the Septuagint say 75 but Deut 10:22 says 70. 4. Philo, a non-Christian Jew was aware that the Hebrew and Greek texts before him used both 70 and 75 and goes into a lengthily discussion about it. a. This proves that Stephen, through inspiration was quoting the valid number of 70.
b. The truth is that there must have been two different textual traditions in these passages. c. The problem is not that Stephen contradicted the Torah, but that the Torah “diverges considerably” [quoting Singer] with itself! d. Again, these kinds of textual variations exist 10 times more frequently in the Old Testament than the New but they are all minor and do not change the meaning or message of scripture and are no cause for concern for Christians and Jews alike. They also do not provide any solid evidence for the Atheists etc. that the Bible is unreliable. Indeed, the Bible is the most historically validated book on earth! a. While Rabbi Tovia Singer might delight that Josephus uses “70” instead of “75”, this in itself refutes his false claim that Josephus is a corrupt and unreliable product of the Byzantine church. Singer is on record that the church corrupted the text of Josephus by making the numbers of Gen 5 and 11 conform to the Septuagint in opposition to the Masoretic text. But the fact that the early church took note of the difference of 70 and 75, and Josephus reads 70, is proof the church did not tamper with the text of Josephus. Further, Philo, a Jews early first century historian, uses both 75 AND the larger genealogical numbers in Gen 5,11, both of which agree with the Septuagint. All this appears to be above Singer’s comprehension. D. Stephen was right: 75 persons went down to Egypt. a. Three Jewish manuscripts that predate Christianity, verify that the text of the day read “75 persons went down to Egypt: Two dead sea scrolls and Philo, the Jewish historian. b. The Septuagint uses 75 in two verses and 70 in a third. c. The 11th century AD Masoretic Hebrew text uses 70 in all three places of the Old Testament. d. Josephus, Philo, the Masoretic and the Septuagint all demonstrate a wide range of ways of computing who went down to Egypt. e. While Josephus uses 70 in agreement with the Masoretic Hebrew Text, he quotes the larger genealogical numbers in Gen 5 and 11 in agreement with the Septuagint. 2. When Rabbi Tovia Singer attacks Stephen in Acts 7 as mistaken in an effort to trash the Christian Bible, the conclusion is that the New Testament is 10 times more reliable than the Tanakh in regard to extant manuscript witnesses. The Old Testament has 10 times more variations in it like the one he points out in Acts 7:15 (70 vs. 75 persons). a. Singer’s “shoot from the hip blindfolded” unscholarly lies become counterproductive and self-destructive to his own cause. Yet even a superficial survey of his criticisms of Christianity shows Tovia to be an untrustworthy information source and very wrong in the majority of what he teaches. iii. 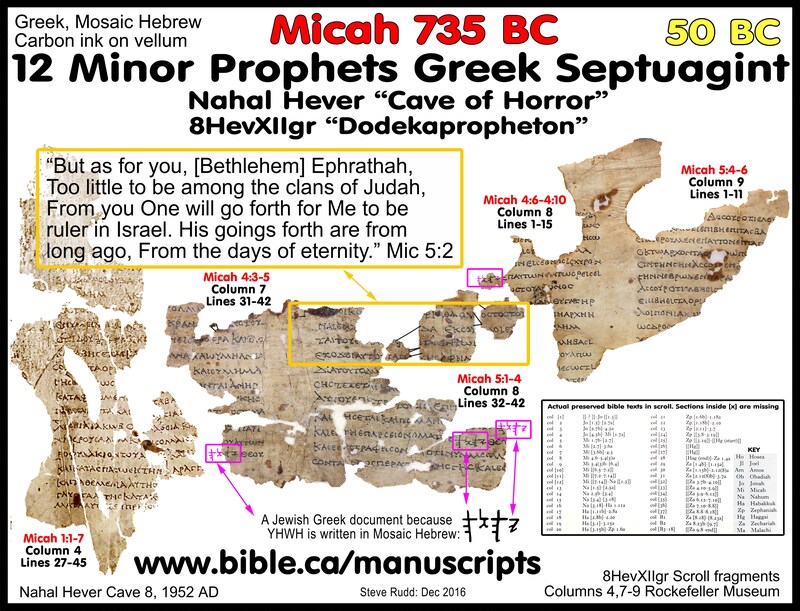 TOVIA SINGER REFUTED: Read the full outline of the Greek Septuagint scroll of the 12 minor prophets that dates to 50 BC. E. When Jews attack the reliability of the New Testament they attack themselves 10 times worse. 1. Christians never attack the Tanakh as being full of “contradictions and historical errors” because they understand most of these are irrelevant and insignificant. 2. It must be disheartening for Jews to learn that when their Rabbis claim the New Testament is full of “contradictions and historical errors”, that the Tanakh has 10 times MORE of exactly the same kind of “contradictions and historical errors”. 3. Rabbis who lead these attacks are either ignorant of the facts of textual transmission for the Old and New Testament, dishonest or hypocritical. 4. It is blind sighted for these Rabbi Tovia Singer to defend the textual variants in the Tanakh, then attack the few and lesser significant textual variants in the New Testament. He make himself look like a “sloppy uneducated hick”. Furthermore, Atheists, Muslims and Mormons love to quote these kinds of discussions as FALSE proof that the Bible is worthless. Rabbi Tovia Singer should stop destroying his own Tanakh. This is fight he lost before he started. 5. In this spirit, Christians rise above such worthless attacks on scripture and this is the reason we refuse to generate the long list of “alleged contradictions in the Tanakh”. We don’t need to because the Muslims have done the job already. READ 101 ALLEGED CONTRADICTIONS IN THE BIBLE CLAIMED BY MUSLIMS REFUTED. 6. 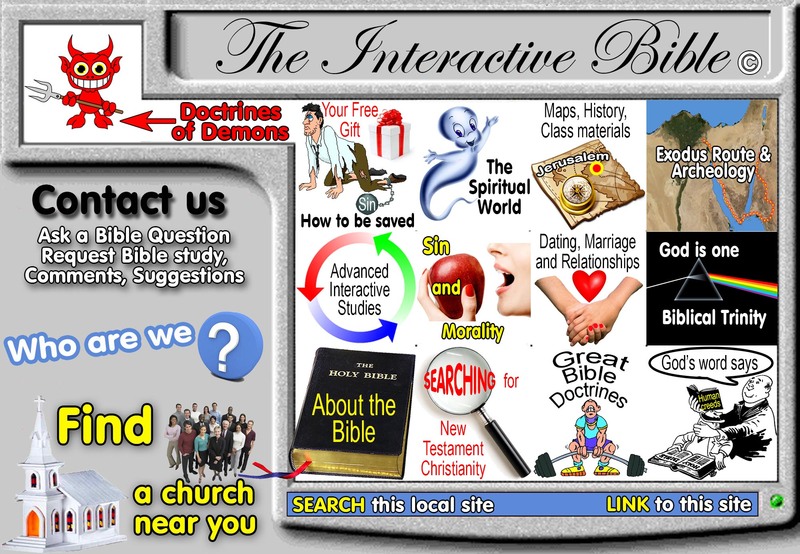 Having said this, the 66 books of the Bible are the most reliable collection of literature on earth bar none. 7. Jesus said: “Scripture cannot be broken”! That is why Christians defend the entire Bible including the Tanakh. 18. Judah offered to sell Joseph for 20 pieces of silver. Judah in Greek is Judas who sold Jesus for 30 pieces of silver. 43. Both wore royal robes and dressed as a king, Jacob wore pharaoh’s royal robe with necklace. 1. Joseph was a type of Christ. a. The parallels are so striking and so dramatic that they just pop out at you! b. This is a powerful witness of Christ in the Old Testament. c. While we have identified over 70, there are most certainly more we have missed. 2. Trust the entire Bible, Old Testament (Tanakh) and New. a. All scripture is inspired by God. 3. What you read in the book, you find in the ground! closest local church for you to attend. By Steve Rudd: Aug 2017: Contact the author for comments, input or corrections.